In what seems like the effect of warmer temperatures on our poles, both the Arctic and the Antarctic witnessed a dip in sea ice extent earlier this month. The Arctic sea ice appears to have reached a record low wintertime maximum extent on March 7. Similarly, on March 3, Antarctica experienced its lowest ice extent at the end of summer. On February 13, the combined Arctic and Antarctic sea ice numbers were at their lowest point since satellites started measuring sea ice in 1979, the NASA says. The total polar sea ice covered 16.21 million square kilometres, which is 2 million square kilometres less than the average global minimum extent for 1981-2010. Ice floating on top of the Arctic Ocean and the surrounding seas shrinks in a seasonal cycle from mid-March to mid-September. As Arctic temperatures drop in autumn and winter, the ice cover grows again until it reaches its yearly maximum extent in March. The ring of sea ice around the Antarctic reaches its maximum in September and its minimum in February. This winter, a combination of warmer-than-average temperatures, winds unfavorable to ice expansion and a series of storms halted sea ice growth in the Arctic. The Antarctic sea ice saw an early maximum extent in 2016, followed by a very rapid loss of ice starting in early September. Since November, daily Antarctic sea ice extent has continuously been at its lowest levels in the satellite record. The ice loss slowed down in February. This year’s record low happened just two years after several monthly record high sea ice extents in Antarctica and decades of moderate sea ice growth, scientists say. The Arctic Report Card does not paint an encouraging picture. 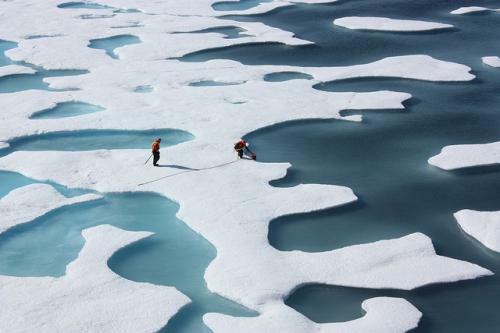 According to researchers, the Arctic continues to warm up at an “astonishing” rate. “The Arctic as a whole is warming at least twice as fast as the rest of the planet,” says Jeremy Mathis, climate scientist at the National Oceanic and Atmospheric Administration. Warming in the Arctic is causing permafrost (normally frozen ground) to melt. As the permafrost is carbon-rich, when it melts it becomes a source of greenhouse gases.